Valentine’s Day Eve was always a big deal in the Hensley household. In fact, every holiday, be it major or minor, was marked in our family by surprises in the morning, decoratively displayed at our ‘places’ at the kitchen table. I love my Mom for countless reasons and this is one of them. The sense of anticipation she created by always delivering something special on the day sticks with me even now. In addition to cards and a bit of candy, there were always a few beautifully wrapped ‘gifties’ such as an item of clothing or a small piece of jewellery. Even though we no longer share the same table or the same continent, not a holiday goes by that a little something doesn’t arrive in the post. At forty-three, I still get to feel the anticipation of opening my card and sweets from my Mom. On this Valentine’s Eve, I’m at home alone; my girl’s having gone for a sleepover at a friend’s house. Knowing that they wouldn’t be here in the morning, I packed special bags for each of them to open in the morning, much the same way my Mom has always done for me. I’m a little bummed that I won’t see them open their goodies but it was a trade-off for a much needed night of solitude. When I arrived home alone this evening, I noticed a beautifully wrapped pink bag sitting on the table. The girl’s had taken the money that I pay them for reading books and gotten their ‘ol Mother a Valentine’s present, topped off with my favourite part; a home-made card. Love is love no matter where it comes from on Valentine’s Day! With no interruptions in sight, I made myself a hot bath and soaked in the candle light for a while. I began to reflect on the Valentines and men who have come and gone in my life and what life would have been like had I stayed with any one of them. With a firm belief that every man who has blessed my journey is a member of my soul group, I recounted the role that each one played in moving me further along my path. My college sweetheart turned husband was responsible for my move to Charleston, South Carolina, the place where the accident that became the cornerstone of my life took place. After we divorced, my next boyfriend was a past Olympic contender and amazing physical specimen with a heart of gold. He was a fellow Chiropractor and loved me enough to let me go, pushing me to follow my heart to Ireland. A brief romance with a quick-witted Irishman who was extremely fond of a drink, allowed me to recognise that my purpose here was much grander than to frequent the pubs; dulling my senses and avoiding my call to serve. With a personality larger than life, my Adonis swooped in next, sweeping me off my feet with tales of his far away homeland and his adventures on the high seas. The beautiful souls that were to become our daughters certainly hand-picked this scenario, ensuring two parents who live on the edge, a lifetime of travel and the world as their oyster with not one, but three passports. Several years passed before my heart was to be taken again. Although I was certain at the time that this soul mate would be the last, the Universe unfolded a different plan and I parted ways with love once again; a far better person for having known him. I’ve been on my own for quite some time now and there have been times that I have questioned if this is to be my destiny. This is a funny incarnation for me. One where I have clearly dedicated myself to my purpose here on Earth, at the expense of every significant relationship I’ve had so far. Yet, I look back and can’t imagine life had each one of them not been a part of it. I truthfully believe that per a soul agreement, each one lovingly signed up for the major influence, albeit brief, that they would have on my life. Each partner was so perfectly timed, so very present while with me and so dramatic in their entrances and exits. I simply wouldn’t be who I am had anyone not played their part. It is because of this that I can say I loved them all. Being in a relationship with me is like trying to pin a wave to the sand. If you have a real understanding of how soul groups and soul mates operate, then you won’t feel too sorry for the men that appear to have been left in my wake. While consciously the awareness might not have been apparent, sub-consciously, on a soul level, they lovingly agreed to play their part in my personal growth and development, just as I desired to assist them on their own paths towards enlightenment. There are no hard and fast rules as to how we are to know love…just that we find a way to know it at all. My parents loved for 60 years and this is divine. I have loved many in a much shorter space of time and this, too, is divinity in action. 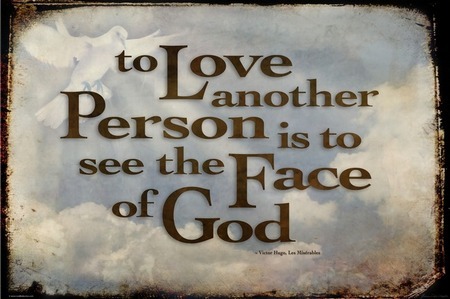 As Jean Valjean said, “To love another person is to see the face of God.” I count my lucky stars that I have experienced the Creator’s complexion more than once this time around. I truly loved them all. Happy Hearts Day and my love to you.